Bosn's Favorite Jerky! Take a few of these bags out to sea for a high-protein snack! Buffalo Bills Premium Beer Jerky is the brew you can chew! To make this specialty jerky, we slice USDA top round into strips, soak them in a beer marinade (Honey Brown Ale to be exact) with a mild seasoning blend, and then hang the beer marinated beef strips in our smokehouse. The end result is one unique and flavorful beef jerky that both beer lovers and jerky lovers will truly enjoy. 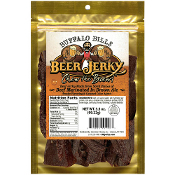 Try Buffalo Bills Premium Beer Jerky. Chew the brew! Click on the pictures below for additional product details.